There isn’t many place where you get to eat while doing charity right? I’m so excited to come to this place after knowing their background. The Lighthouse Cafe & Bakery is located inside St. Francis Xavier Church so if you couldn’t locate the cafe using your GPS, you can plot it to St. Francis Xavier Church instead. So what is so special about this place? It’s not a fancy and beautiful cafe but it is really meaningful. All proceeds from this cafe will go to maintaining this place and also to support homeless people in their Feeding Program. All workers in this place are people who are not accepted by the society due to their past and this place is giving them the second chance in life. How compassionate! I wish more people are like that; compassionate, forgiving and helpful! Hmmm which should I choose? Nasi Lemak from the stall inside the vicinity of cafe with homemade sweet and sour sambal at only RM 2.50! Very affordable and super delicious! The stall owner said you can’t find other sweet and sour sambal in Penang cos it’s their own recipe! They make excellent Curry Puffs but you need to be here around 9.30am to get it. I was there too early and they haven’t got it baked so I ordered 10 of it and collect it the next day. 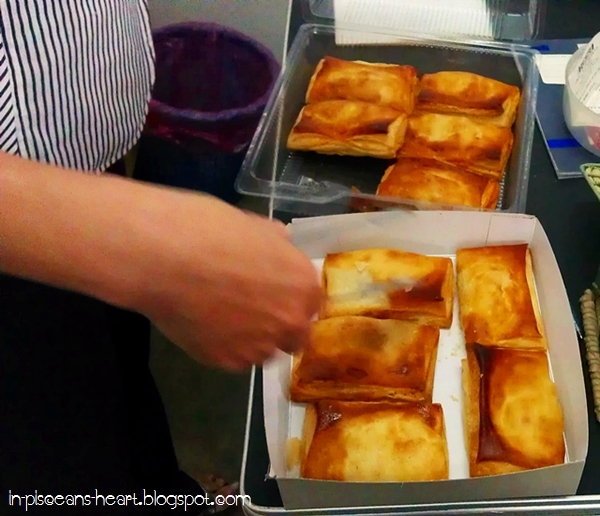 Each Curry Puff costs RM 1.30.